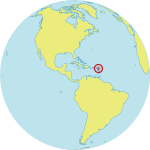 ST. JOHN’S, Antigua and Barbuda – A scurry of activity greeted visitors at one of Antigua’s two largest temporary shelters, National Technical Training Centre, which houses around 70 Barbudans displaced by Hurricane Irma. Shelter manager Samantha Burnette appeared with her phone in hand and a large, welcoming smile. She is one of several dedicated women leading the country’s recovery efforts. Women and girls are disproportionately vulnerable in times of crisis. They face greater obstacles to securing their safety and dignity, including diminished access to protection and health services and even hygiene supplies such as sanitary napkins. Incidence of gender-based violence often escalates in these settings. Hurricane Irma forced the evacuation of more than 700 women and girls, including an estimated 65 pregnant women, to temporary shelters in Antigua. Families have remained intact, mitigating some of the risks to women and girls, experts say. But many evacuees do not know where or how to seek health and psychosocial care. In response to these issues, UNFPA worked with Antigua’s Directorate of Gender Affairs and UN Women to distribute dignity kits, which contain soap, toothpaste, sanitary napkins and other materials. They are also facilitating community discussions at the shelters, in order to better understand the needs and concerns of women and girls. Community leaders like Alethea Byers, a director in the Ministry of Social Transformation, believe women must be empowered to support one another. Since the storm, Ms. Byers has coordinated relief efforts and served as a mentor for affected women. “I want to lead; I want to help women move forward,” she explained. One of the women she befriended was Gwendolyn Walker, a social worker displaced from Barbuda. Ms. Walker now manages the temporary shelter where she stays, the Anchorage Hotel. As of mid-September, the hotel accommodated some 40 Barbudan residents. Like many other women, she became a leader out of necessity. After arriving in Antigua the night of the evacuation, she saw four elderly citizens quietly sitting alone. Unwilling to leave them without care, she stayed to look out for them. By the end of the evening, she found herself caring for eight people. 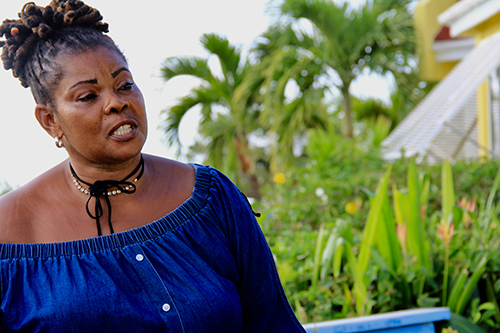 Ms. Walker says maintaining her community’s cultural identity is critical to rebuilding Barbuda – as is bringing women into the recovery process. Women must have access to services that support their well-being, she explained. “We need to know how to deal with our current situation,” she said. UNFPA and its network of partners are preparing to provide a range of support to Hurricane Irma survivors, including training on preventing and responding to gender-based violence, aimed at shelter managers, health workers, providers of psychosocial support and security personnel. With its humanitarian partners and local community organizations, UNFPA will also provide information on where and how to access services. UNFPA is also working with the Ministries of Health, the Pan American Health Organization, the Caribbean Family Planning Association and others to deploy sexual and reproductive health supplies and other support to health facilities.